Kate Wootton has sent me information about her great great Aunt, May HENDERSON (1891-1981) who was an Infant teacher. There is more information to follow. May’s parents were both local - her father James was born in Liverpool and his wife Elizabeth (nee BELL) in Cheshire. Her father worked for the Post Office, initially as a letter carrier and later as an Inspector. May was born 30th November, 1891 at Penton St, West Derby, Liverpool. The family are listed at 4, Upper Baker St in the 1901 and 1911 census. May Henderson attended Boaler St school as a child, as did Kate’s Grandfather. 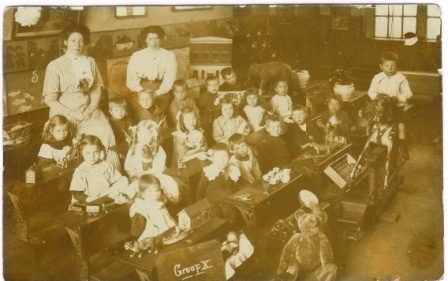 Kate sent a picture of the infants at the school. She trained as a pupil teacher in Liverpool. Kate has her agreement dated 1906 signed by Ralph PICKMERE, her certified teacher certificate, dated April 1914 and her certificate of Associate in Arts of the University of Oxford (1909) and numerous other bits and pieces. 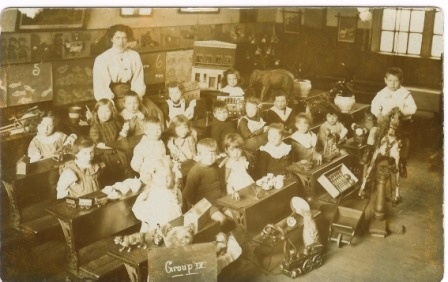 May started teaching at Queens Rd Council School but then moved to Somerville Rd council School in Seacombe, Wallasey in 1914, then to Poulton School in 1916. She continued to work in schools in Wallasey until 1958 - mainly at St George's Infants where she was the reception teacher. She was very much liked and respected - Kate still has a number of letters from parents. May retired in Wallasey, and lived there until her death in 1981.